This history was released in the company's 75th anniversary booklet in August, 1978 and was originally researched by Charles A. Roberts, then of Virginia Beach, and edited by Lee Cahill, then of Chesapeake, VA. What follows is a combination of the original text and images, with additional images included from various archival sources. In the early part of the century, a young man named Albin A. Tomlinson, came to Norfolk, Virginia from Wilmington, Delaware to start a plumbing and heating supply business. Now, over 75 years later, that business has nine branches in Virginia and North Carolina and a reputation for dependability earned over the years through farsighted leadership and diligent, experienced personnel. The name of the original company, Virginia-Carolina Supply Company, actually describes the territory the business now serves. Back on January 22, 1903 when the company received its charter in Norfolk, the name was appropriate because the trading area of the new enterprise included Southeastern Virginia and Northeastern North Carolina. Mr. Tomlinson came to Norfolk in the latter part of 1902 after leaving Speakman Company in Wilmington where he had been employed for several years. Speakman was then primarily a foundry and it was much later that the company became famous for its Speakman Showers and other top-quality plumbing brass goods. During the course of arranging the rental of a building on Commerce Street, just off Main Street in downtown Norfolk, Mr. Tomlinson became friendly with the owner, Colonel C. A. Nash. As a result of this friendship, Colonel Nash joined the business, Becoming the first President, with Mr. Tomlinson serving as Secretary-Treasurer. Other officers listed in the original charter were J. W. Perry, Vice President; P. F. Lee, General Manager, and W. W. Starke, General Counsel. Directors included the officers and George T. Banks, H. B Goodridge and Dr. Edwin G. Lee. Original stockholders, in addition to the directors, included T. S. Southgate, Dr. Roland H. Walker, E. W. Smith, John R. Pierce and William B. Tomlinson. John B. Jenkins and J. J. Lawler became stockholders and members of the Board of Directors in 1907. The original 15 stockholders held 125 shares of stock and included the younger brother of the founder, W. B. Tomlinson, who came to Norfolk from Wilmington in the fall of 1903 to work for the company. Much of the stock of the company is still held by descendants of the original stockholders. Business prospered for the Norfolk company which was one of the few wholesalers serving the plumbing trade between Baltimore and Atlanta. It was the right time to start a wholesale plumbing supply business: "indoor" plumbing was coming into its own and many improvements were made in plumbing materials as well as hot water and steam heating equipment for both residential and commercial installations. Less than three years after the company was chartered, the Board of Directors, on November 29, 1905, authorized the establishment of a branch operation in Richmond, Virginia and this store was opened in 1906 at Number 7 Governor Street. This outlet flourished, too, and outgrew its plant. Accordingly, the Board of Directors on December 10, 1909 leased a larger building at Number 8-12 South 8th Street. In the meantime, Mr. Perry had been elected President on March 17, 1905, succeeding Colonel Nash who had died the previous month. Dr. Edwin G. Lee was elected Vice President. 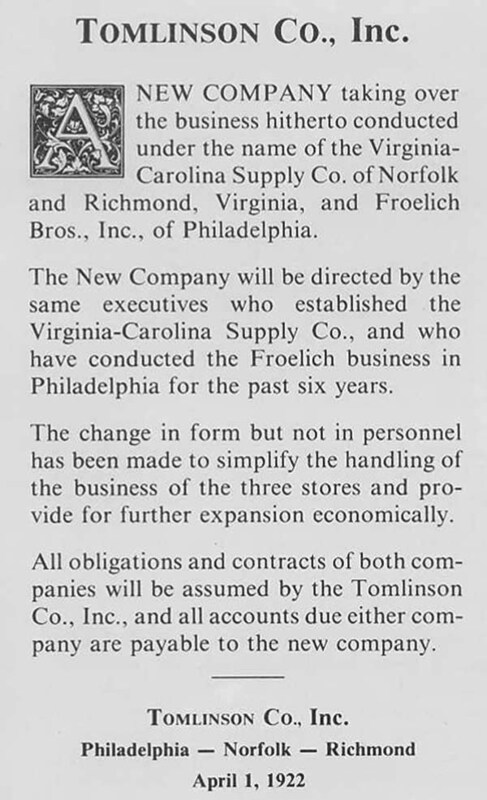 The company's next expansion occurred in the fall on 1915 when it purchased the controlling interest in Froelich Brothers, Inc., of Philadelphia, an old highly-respected wholesale plumbing and heating distributor. A. A. Tomlinson supervised the Philadelphia operation and later made that city his home for many years. The Norfolk and Richmond branches continued under the management of P. F. Lee until W. B. Tomlinson was appointed manager of the Richmond Branch in 1916. Mr. Lee resigned his position as general manager in the latter part of 1919, and Charles L. Roberts, who had joined the organization in 1908, was appointed manager of the Norfolk branch in January 1920. He was elected Secretary of the corporation in February 1922 and served in these capacities until his death, suddenly at 45, on November 15, 1925. The business continued to grow for the next several years and the stockholders, at their annual meeting in January 1920, elected Dr. Roland R. Walker, Chairman of the Board of Directors; A. A. Tomlinson, President, and W. B. Tomlinson, Vice President. In March 1922, the directors authorized the opening of a new branch at Greensboro, North Carolina, and B. F. Rogers was appointed manager. Mr. Rogers first was employed by the company in 1912 in Richmond. His employment, however, was interrupted by service in the Army during World War I. He returned to Tomlinson in 1919 and in 1949 was elected a member of the Board of Directors. The next expansion was the opening of a branch at Durham, North Carolina in March 1925 with Hunter R. Sterling as manager. In May 1929, J. H. Verell, who had joined the organization in 1920, was appointed manager at Durham; in 1956, he was appointed manager of the Richmond branch, and in 1958 he was elected to the Board of Directors. He continued as Richmond manager and Director until his death on January 31, 1968 after 48 years of service. The Tomlinson brothers, who had headed the company for so many years, died within less than 12 months of each other. W. B. Tomlinson died on November 26, 1959 after 56 years of service and A. A. Tomlinson died on October 12, 1960 after serving the company for 57 years. Charles E. Jenkins, Chairman of the Board; B. F. Rogers, President; E. M. O'Neal, Jr., Executive Vice President; Charles A. Roberts, Vice President; A. A. Leath, Vice President and Treasurer, and C. J. Harry, Secretary. At this meeting, A. A. Tomlinson's son, William N. Tomlinson, and W. B. Tomlinson's son, W. B. Tomlinson, Jr., both of whom had been connected with the company's sales department for years, were elected to the Board of Directors. Re-elected to the Board at this meeting were Charles T. Banks and Herbert N. Lee, who had been board members for years. William N. Tomlinson continued to serve as a Director until his death on September 3, 1965. Mr. Banks remained a Board member until his death on October 10, 1964 and Mr. Lee was Director until his death on March 23, 1975. The fifth branch was opened in Burlington, North Carolina in May 1965 with T. H. Stafford as manager. At the January 1968 Board meeting, B. F. Rogers was elected Chairman of the Board and E. M. O'Neal, Jr. was elected President of the company. Also C. J. Harry was elected a member of the board. On the death of Mr. Rogers on January 15, 1969, Charles E. Jenkins became Chairman of the Board. A. A. Leath, who began employment in 1916, was elected Treasurer in 1936 and Director in 1941. At his death on January 27, 1974 he was Vice President and Treasurer, offices which he held since 1959. C. J. Harry, who joined the company in 1920, was elected Secretary in 1949 and Director in 1969, two positions which he held until his death on March 12, 1972. The company continued to expand its operations, opening another branch, the sixth, in South Richmond, Virginia in 1969. W. B. Tomlinson, Jr. is manager there. In November 1970 a new branch was opened in Hampton, Virginia, with C. C. Chapman as manager. When Mr. Chapman was later promoted to the position of credit and collection manager for the company, Phillip B. Yandle was named manager of the branch. In 1975 the eighth branch was opened at Suffolk, Virginia, where A. Lynn Bisese is the manager. The ninth branch was opened in Portsmouth, Virginia in April 1977 with George F. Dupree as manager. Present managers at the older branches are Milton G. Palmer, Norfolk; Floyd T. Hetzer, Richmond; Carl Beckler, Greensboro, and J. E. Tackett, Durham. In December 1977, the Operations Center Office Building was opened in Durham on a site next to the Durham store. This building houses the offices of the president, the secretary and treasurer and the purchasing agent as well as the Computer Division which had been located in an office building in downtown Durham since the company went to full automation in January 1976. Elected to the Board of Directors in recent years were Elsie R. Tomlinson (Mrs. W. N.) in November 1975; C. C. Woods, Jr., in July 1976, and John A. Williams, Jr., in February 1977. At the 1977 meeting, the Board also elected Murphy F. McGirt, Sr., who had been a Board member since 1974, Chairman of the Board. Tomlinson purchases in quantity to offer the most attractive prices to its customers with Durham and Norfolk serving as distribution points. The company's large trailer-truck moves materials regularly to the branches where they are needed most for quicker turnover. Among the larger jobs for which Tomlinson has furnished materials are the Kerr Dam at Buggs Island in South Hill, Virginia; the Smith-Douglass Central Office Building in Norfolk; the J. C. Penney & Company store in Hampton; Surry County High School, Virginia; Harry Flood Byrd School in Richmond; Women's Dorms #1 and #2 at Longwood College in Farmville, Virginia; the Phillip Morris Cigarette plant in Richmond, and the IBM-Burroughs-Environmental Protection Agency building at Research Triangle Park between Durham and Raleigh, North Carolina. Over the years, the company has operated branches at Lynchburg, Virginia and Chester, Pennsylvania, but closed these outlets for economic reasons. The Philadelphia branch was also closed to allow the company to concentrate on expansion in Virginia and North Carolina. Tomlinson now has 90 employees, and where the original 15 stockholders owned 125 shares of stock in 1903, 110 stockholders now own more than 23,000 shares of stock. And the company known for quality and service plus dependability over its 75-year history has an annual volume of sales of over $7 million.